The distribution of the blue-eyed black lemur (Eulemur flavifrons) is restricted to the north-western part of Madagascar and the Sahamalaza-Iles Radama National Park (SIRNP) is its main habitat. The lemur is primarily threatened by habitat destruction due to slash-and-burn agriculture, logging and uncontrolled fires. Due to these threats, the species is classified as Critically Endangered on the IUCN Red List and has been one of the world's 25 most endangered primates since 2008. 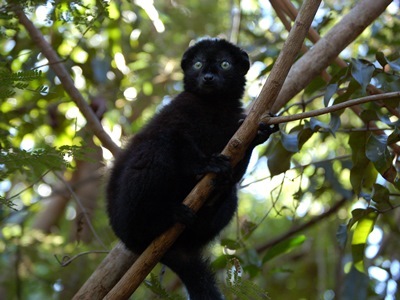 The purpose of this project is to improve the local community involvement in protection of the blue-eyed black lemur. We will assess lemur population size, the forest habitat extent and quality throughout the main habitat in order to update the population status and conservation plan for the species and its habitat. We will train SIRNP rangers to conduct patrols, collect data on lemurs, and inform them of park regulations through workshops so that they can effectively uphold park laws. We will also engage local communities through various education measures to raise awareness about the need to conserve the forest and its biodiversity.